how many of you guys use a lock pattern or password to unlock the phone? Discussion in 'Android Lounge' started by jree, Aug 9, 2010. Just wondering how many of you guys actually use the pattern lock or password before you can use the phone. I have been debating whether or not its a waste of my time b/c even if I get my phone stolen I'm not getting it back. My friends that use my phone can't go through my personal stuff b/c I have a file locker. Even if I did have the pattern lock did anybody create a way to hack it and unlock it like they did with the iPhone? With the LOCK PATTERN method, I must say that I have been able to easily watch my friends from a distant unlocking their phones. Android users are crazy to use the pattern thing if they are SERIOUS about privacy. Just think about it, it's easier to remember a pattern than it is to see someone tapping on buttons. I honestly use something very similar to that. I just really like the puzzle piece thing that comes up as a notification to tell me that I missed a call or have a text. Its very convenient. Do they not use the invisible trace on the pattern? If not then I wholly agree that seeing the pattern from a distance is no problem. I use a pattern. I have the X and it's set to lock after 20 minutes or so of non use. I like not having to unlock it every time the device sleeps. I forgot I could do this. I love having the extra security that prevents nosey people from going through my phone. And I def have it so you can't see the pattern as I am tracing it. me!!!!! 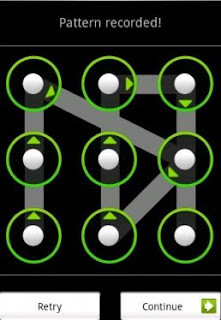 I use a lock pattern because its the fastest way to get my phone unlocked and still keep it secure. Its set to lock after 3 minutes of non use. There are people I know that like browsing through my phone. I will add however, that my 10 year old son was able to figure out my lock pattern simply by glancing at screen when it was turned off and noticed the pattern of my finger swipe marks on the screen. He's a very bright kid they stays on the A Honor roll, but this surprised me. I am going to have to stop underestimating the little guy. The point is, if he thought to do that, then an adult could too, so maybe some extra security precautions are needed. I do not, my girlfriend does however. I guess it all depends. I try not to keep things too damning on my phone. All of the not so decent pics that some females feel they must send to me are stored and locked in a safe digital place. I do have some text converstions that i'd rather no one else see, but I can lock these messages. I use a password but only because I am forced to by Exchange security policy. If it wasn't for that I wouldn't use one as there is nothing confidential on the phone except Keepass which has it's own protection. If the phone is lost/stolen I can lock it down very easily through Wavesecure. I use one. Not for actually 'security'. But my phone has the tendency to unlock itself and start doing crazy stuff and calling people if I don't set a lockpattern.